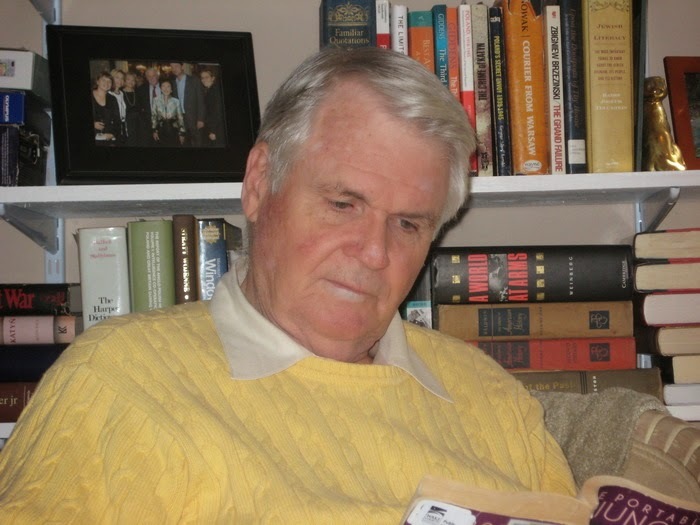 Allen Paul began his career as a reporter with the Associated Press in Raleigh, NC. Later, he wrote speeches in Washington for a congressional committee chairman, a member of the president’s cabinet and the chairman of one presidential campaign. He was in Poland gathering material for his first book when the Berlin Wall fell. That book – Katyn: Stalin’s Massacre and the Triumph of Truth – became a bestseller in Eastern Europe. It earned warm praised from the New York Times, the Washington Post, New York Review of Books and many other media outlets. He was a Fulbright Fellow in Poland in 2010-11 and collected material there for a novel based on a daring mission of the Polish underground at the end of World War Two. It will be published in 2015. His first book for younger readers (middle grade) was inspired by his own dog, Honey, whose breed – the Dixie Dingo – is probably the oldest in North America. Allen holds a B.A. degree in English with a minor in History from Guilford College, and a Masters of International Public Policy from Johns Hopkins University. He and his wife, Betsy, live in Raleigh and have two grown children. "Allen has written a delightful novel about the escapades of Honey the Dixie Dingo Dog living in the swamps of the Southeast. Told in the dog's voice, this page-turning tale is rich in detail and wonderfully captures the landscape..." ―Norman Gomlak, former editor at the Baltimore Sun and McClatchy Newspapers ―This text refers to an out of print or unavailable edition of this title. WHAT FICTION MOST INFLUENCED YOUR CHILDHOOD, AND WHAT EFFECT DID THOSE STORIES HAVE ON HONEY THE DIXIE DINGO DOG? My mother read to me nearly every night when I was growing up. She was a great fan of Kipling and the “Jungle Book.” For some reason I can remember very vividly a Kipling character saying there is “no nagging” in the jungle. Punishment was meted out to those who did wrong, but it wiped the slate clean – in other words no nagging occurred once an animal had been punished. My parents were devoted to the principle of “Spare the rod and spoil the child.” I remember well how my mother punished: She’d go to the tall hedge in our backyard and break off a switch. As she walked back to the house, she stripped the leaves from the switch. She would switch my legs (I wore shorts through the third grade) several times which hurt enough to make me cry out. When she finished she always said, “Enough’s enough; there’ll be no nagging in the jungle.” It made quite an impression, but not enough to keep me from earning a few more switches in a week or two. Kipling became one of my favorite authors as a child and remains so today. IN THE BALD cypress swamp where I was born the alligator was king. Papa always said the big ‘uns were mean snake-sly and fly-snatchin’ fast. Imagine one of those half-sunk rascals posin’ as a harmless log. Some poor critter comes moseyin’ by, and quick as a flash it pops up and zaps ‘em. That low down stunt was the worst we’d ever heard tell of in the swamp. Every so often the gator fakin’ got so bad swamp elders had to put out a travel alert for the Critter Trail. Warnin’ signs went up to watch for bubblin’ logs. To avoid those devils half sunk in the muck, us pups had to take the Beast Feast Detour. Can’t tell you how many times Mama would say: “Now girl,you keep a close watch out for gator logs.” She worried I’d forget just once and get turned into a two or three bite meal. That scary thought caused many a dream of thirteen-foot gators. In the worst case, I’d step on one with huge gapin’ jaws and snarly rows of teeth. It took a vicious swipe that just missed, and I ran flat out through the marsh. No matter how I zigged and zagged, the gator kept gainin’ and gainin’. Pretty soon it was snappin’ at my tail with bone crushin’ chomps. I was a goner for sure when the ole soap bubble popped. As I came to, it felt like my tail got whacked and I told myself: You can’t be a dog without a tail—not even a mutt. A quick check and … whew, it was still back there, but so was a chilly draft that kept right on gustin’. Bad dreams can mess with your head in just that way, especially when you’ve just turned one year old, which, I’ve been told, is ‘bout the same as a human critter of ten. Afterward, Mama always nuzzled my nose and asked, “Same bad dream?” I’d turn belly up and get the licks that calmed my pantin’ and shakin’. But that didn’t make the dreams go away. In another, a sly-grinnin’ gator said, “Hop on my back and I’ll ride you across the pond.” I knew the story of the frog that did that and never made it across … so I took off lickety-split for the high ground. The two-faced gator gave chase, and ‘fore long it, too, was snappin’ at my tail. Once again the ole soap bubble popped, and I felt another backside draft. At the time, I just wanted Mama to make it go away. Later on, when she wasn’t there, I came to understand what the air blast was sayin’: The threat is always back there. I s’pose my wild genes were talkin’ ‘stead of Mama. If you’re part of a vanishin’ breed like me, you need wild genes to tell you when and how to dodge. Trust me: You can’t survive in the swamp without ‘em. Like Mama, my genes always told me to keep a close eye on gators. I watch ‘em now, glidin’ through the early mornin’ fog like pole-powered skiffs … feedin’ on cottonmouths, crunchy turtles or some poor possum dozin’ on the bank. In the spring, ornery males crawl out of wallowin’ holes lookin’ for females to court. They’ll roam a mile or so through the muck bellowin’ at every step. When our pack hears that hullabaloo, we hightail it up the ridge to the black gum thicket where our den is hid. ‘Til the lover boys calm down, we only go out for quick hunts close by. Never seen a big ‘un up on the ridge, but Mama still reminds me ‘bout bein’ a two or three bite meal. Sound scary? Lemme just say the swamp’s got a soft side, too; it ain’t all mean by any stretch. The early mornin’ fog creeps in like smoke from a slow burnin’ peat fire. A light breeze stirs and limbs reach through the dewy haze like giant bird talons, and fluffy beards of Spanish moss unfurl. The fog lifts its skirt even more to reveal the swamp’s greatest wonder: giant cypress domes all flattened out on top (that’s why we call ‘em bald). Papa calls those domes the swamp’s umbrella; they shade the critters when the sun beats down. By mid-mornin’ when the ground clouds clear, it gets so hot the critters just snooze or watch the butterfly army marchin’ to the purple milkweed patch. The tawny-orange monarchs can snack there to their heart’s content. Like I said, the swamp’s got a soft side, too. Even so, the swamp elders always said: “The Critter Trail ain’t easy street. No one gets off scratch free.” Papa says the proper term is “Scot free,” and what they really meant is you’re bound to get bit … and maybe bit hard. When I finally got whacked, I thought the soap bubble would soon pop, that Mama would then nuzzle my nose. But that didn’t happen, and I soon knew no dream was messin’ with my head. You might say when the mornin’ fog finally lifted its skirts I had no place to dodge. I was like one of the dodo birds long ago on that island in the Indian Ocean, part of a vanishin’ breed … wishin’ and wishin’ hard that my wild genes could save me. Bestselling and award-winning author Allen Paul has created an endearing character in Honey, a swamp dog who gets rescued at the moment she's about to get shot. Taken to live at Banbury Cross Farm with other rescued Dixie Dingos, her quick cuts and darting turns soon draw notice; she's then trained for agility championships, the most popular of all canine sports. From the start, Honey forms a deep bond with Miss Jane, who saved her in the nick of time. Her trainer is Ace, a worldly wise black man who manages the farm's kennel. Honey forms another deep bond with Miss Jane's partner, Mr. Billy, a skilled horseman who delights Honey by quoting famous rhymes. The story is told by Honey in a charming southern voice. She's just turned one (equal to a 10-year-old girl or boy) when the story begins. At its center is a haunting mystery: Why are swamp critters turning up dead with a wild look in the eye? Many believe a big coyote named Geronimo scares them to death. When two dead dingo pups are found, Honey becomes convinced that her pack, which is still in the swamp, could be next. Somehow she has to get them out. The plot thickens when several small pets get killed in the nearby town. Rewards are posted and a group led by the trapper Topper Guy, who nearly shot Honey, head for the swamp. Twelve innocent dingos mistaken for coyotes get shot. Miss Jane confronts Topper Guy and demands that the killings stop. The upshot is a high stakes bet: Topper Guy wagers his guns against Miss Jane's favorite horse that Honey won't win at the Sportsman's Championship. How Honey fares in that contest, and how the mystery killer gets caught, make for a thrilling read that kids at heart of all ages will love. In the end, Honey learns an unforgettable lesson that her pack, which now includes humans, comes first. Based on a true story, this book will appeal to middle grade readers and adults. On July 17, 2013 a front-page article in the New York Times cited new genetic evidence suggesting that the Dixie Dingo (registered as the Carolina Dog) is the oldest breed in North America, predating European settlement by many centuries. They were Native American camp dogs but are not related to the Australian dingos. Many Dixie Dingos still live in southern swamps. With their antenna-like ears and muscular build, their look is quite distinctive. Dixie Dingos are excellent pets who form deep bonds with humans. Thank you ALLEN PAUL for making this giveaway possible. 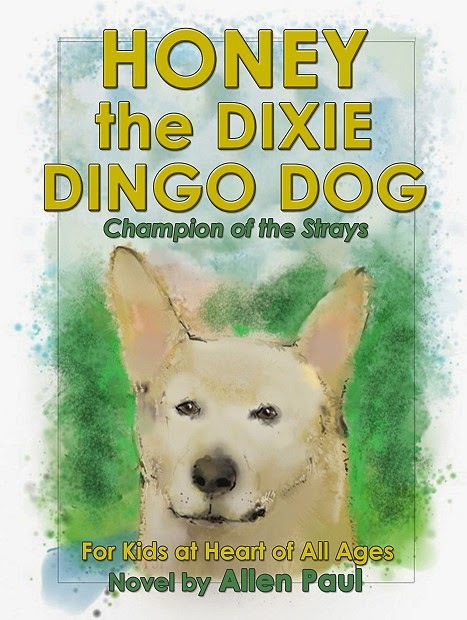 1 Winner will receive a Signed Copy of Honey the Dixie Dingo Dog by Allen Paul.